Thurman Maness, longtime Moore County, NC historian and keeper of the Maness heritage died in 2010. Fortunately Lacy Garner, Tom Stewart and others had Thurman tested a couple of years prior. Thurman was a proud descendant of Revolutionary War soldier William Maness Jr. [c1738-1832] and his father, William Maness Sr. [d.1787]. 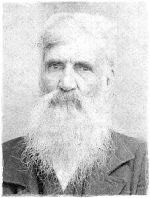 Thurman further descended through one of William Jr.'s triplet sons Abednego Maness > Issac Maness > Thomas P. Maness > Reuben Addison Maness [Thurman's father]. The Maness DNA Project has done an excellent job of collecting Maness samples from around the country and Thurman's DNA matches [at varying levels] over 30 additional samples in Group 1 of their analysis. The Maness Project summarizes that while it cannot be proven completely given the lack of pedigree information on several of the samples, it is possible that William Maness Sr. was the common ancestor for all of Group 1. This would tract what Thurman and other Maness family researchers have believed for years - that most of the Maness' in the southern United States descend from William Maness Sr. of Moore County, NC. As far as William Sr.'s origination, the Maness Project correctly states that there are a number of theories, thoughts and rumors but to date none have been proven.